There is not a more luxurious condiment known to God nor man than a classic Hollandaise Sauce from Scratch. Drizzle it over eggs, paint it on a steak, or simply bathe asparagus spears in this indulgent sauce. When I first started cooking Hollandaise was the first sauce I learned to make. I think it was because I had a hard time finding it in the grocery store, however back then, unless it was frozen pizza, I had a hard time finding anything in the grocery store! My idea of gourmet cooking was simply squeezing the cheese packet into the freshly boiled batch of noodles. Julia Child turned me on to the immense goodness of this luxurious sauce. I got my hands on an old copy of her Mastering the Art of French Cooking, and I read through it like a Fifty Shades of Gray novel. Her Hollandaise Sauce recipe caught my eye and I was hooked after my first attempt. What is Hollandaise sauce exactly? Well, despite Julia Child’s fame of being a French chef, Hollandaise is actually a Dutch sauce made from emulsifying egg yolk and blending it with lemon juice, water, and a generous amount of butter. Tip: I often cut back the butter in my recipe, when I am cooking for myself. The lemon flavor stands out more, and it is mildly healthier. However, if you want the full luxurious experience, go full-bore butter! My favorite tool for making hollandaise sauce is a simple Silicone Whisk that won’t scratch my non-stick pans while I am continuously whisking. It is important to diligently whisk the egg yolk so you don’t curdle the yolk from the heat. This article contains affiliate links. Any Amazon purchases made through these links helps support FoxValleyFoodie.com at no additional cost to you. 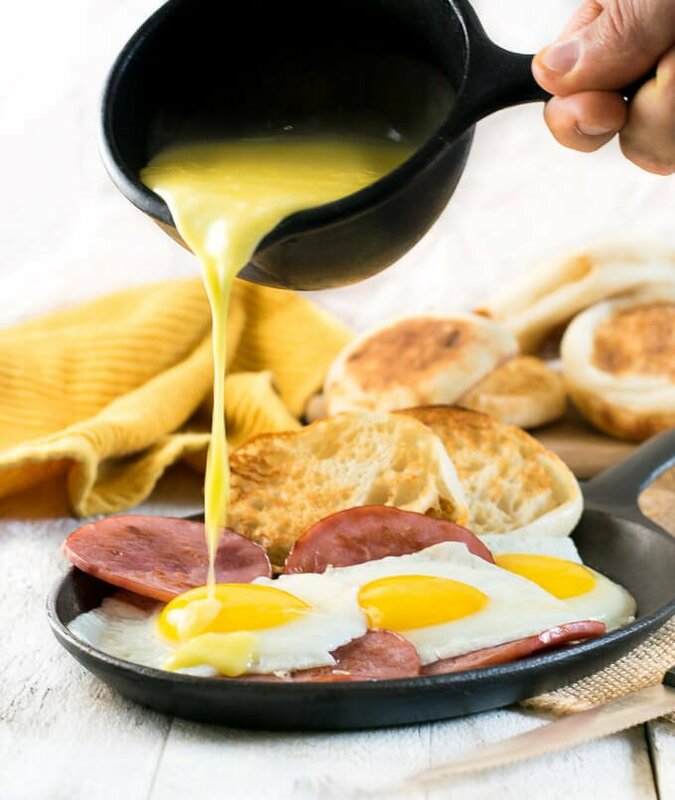 Using a small pan on low heat, add egg yolks, lemon juice, and water and whisk to combine. Continue whisking until mixture begins to thicken, turn slightly frothy, and you can see the bottom of the pan through the streaks from your whisk. If at any point the egg curdles, turn down the heat and start over. Season with optional cayenne, salt, and pepper to taste. Serve immediately. If the sauce sits, it will thicken. It can be thinned out again by adding a few dashes of water. IF YOU LIKED THIS RECIPE you will love my secrets to making Perfect Scrambled Eggs from Scratch! 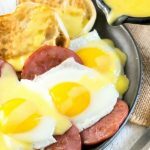 If you enjoyed reading my Hollandaise Sauce from Scratch recipe then you should probably like me on Facebook and follow me on Pinterest too. That’s what I would do at least, because if you don’t get to know me but you still use my recipe it is kind of like taking candy from a stranger, and your mom taught you not to do that. Don’t disobey your mom, subscribe to Fox Valley Foodie today. 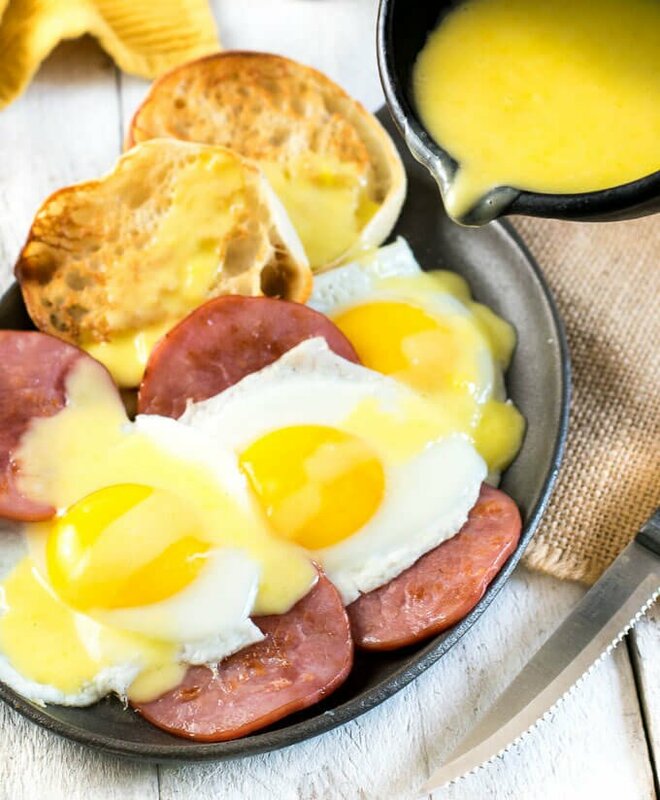 There is no better breakfast than eggs covered in hollandaise!